Recorded in several spellings including Well, Wells, Welman, Wellman and Wellsman, this is an English surname. It has a number of possible origins - topographical, locational, or even job descriptive. If locational, it originates from any of the various places such as Well near Bedale in North Yorkshire, or Wells in the county of Norfolk and in Somerset. However spelt all derive from the pre 7th century word "waella" which describes not a well, but a spring, and probably one that was associated with a holy place. "Wells next the sea", in Norfolk is recorded in the Domesday Book of 1086 as "Guelle". As a topographical surname it denotes residence at or by such a spring or well, as in Roger Attewell of the county of Sussex in the year 1200. This is also a surname that survives in modern times as Attwell. As an occupational name with the suffix "-man", this probably denoted somebody responsible for looking after the village spring, although not necessarily in any other way associated with the various places called Well or Wells. Early examples of church register recordings include Robert Wells, who was christened on January 7th 1557, at Christchurch Greyfriars, in the city of London, whilst Richard Wellman was recorded at St Georges Chapel, Hanover Square, Westminster, on March 1st 1730. Ann Wells, at the age of 15 years, was an early emigrant to the New World. She left London on the ship "Planter" in 1635, bound for Virginia Colony. 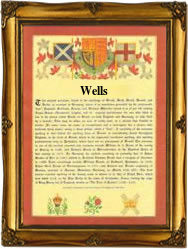 The first recorded spelling of the family name is shown to be that of Toke de Wells. This was dated 1177, in the pipe rolls of the county of Norfolk, during the reign of King Henry 11nd of England, 1154 - 1189. Throughout the centuries, surnames in every country have continued to "develop" often leading to astonishing variants of the original spelling.